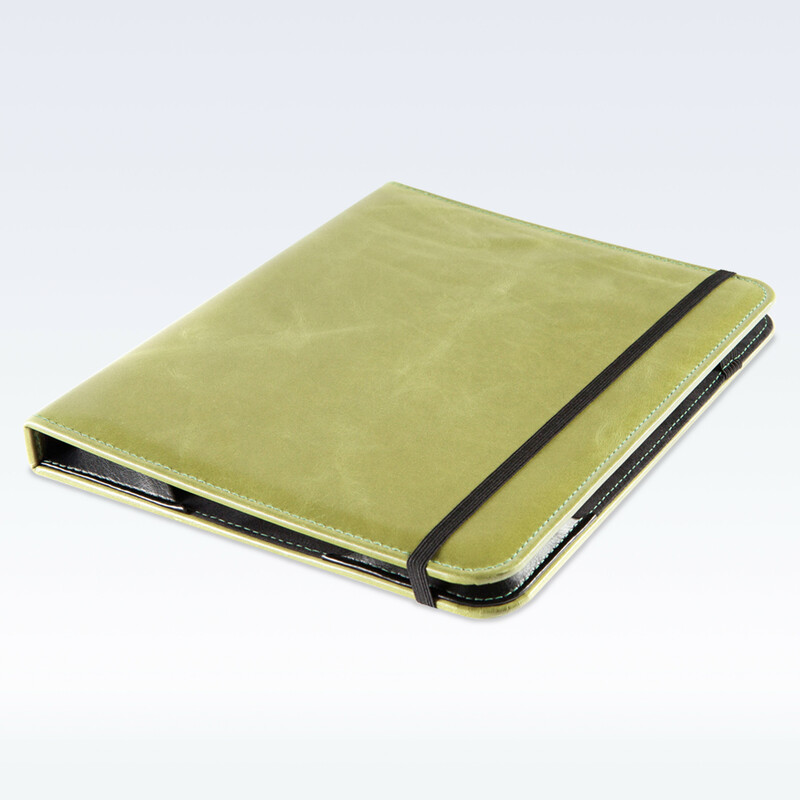 A slim compact iPad /tablet notebook style case in our soft Kensington Leather. Designed primarily to fit the Apple iPad but due to the simple design and soft leather, will mold to fit the original iPad and other similar sized tablets. The Spring Green is a beautiful light fresh tone of lime Green. This notebook style case is lined in a sueded micro fibre fabric to keep your tablet in pristine condition, protect your iPad and subtley polish the screen as you place the iPad into and out of the case. Internally the case has base corner pockets and top corner elastic to securely keep your iPad or tablet in position. The clean lines and slim design of the case adds no bulk to your bag or briefcase, and will stylishly safeguard your iPad if carrying loose, the notebook style durable elastic, keeps the case tightly shut and will hold your ipad or tablet securely enclosed within and also camouflage your expensive iPad as a simple notebook. The premium grade Italian leather is supple and will further soften with use and wear, and the only subtle decoration is the StJ logo on the rear at the bottom, providing you with a classic, stylish luxurious case for your favourite, invaluable piece of technology. Flexible Design to fit iPad 1,2,3 & Air 1&2. Velvet Lining to protect your screen. Beautiful soft leather with a distressed finish ensuring every piece is unique.